I know it is a good idea to watermark the photos I post online. My problem is that I don't use Photoshop routinely with my photos. At this point, I have hundreds of photos online, and wouldn't want to go back and find and edit each photo on my laptop, and then upload again to each individual post in Blogger. Way too much work. So, how do you watermark your photos that are already online in Blogger? I have searched and tried a few editors, and have found a free straight-forward solution that works!! I am able to watermark the online photos without touching the originals that I have stored somewhere on my personal computer. I prefer to keep my personal photos without the watermark anyway. Since I'm editing the online photos, I don't need to re-upload any image to any specific blog post either. That's nice! FIRST, DID YOU KNOW? All images that you upload to your Blogger blog are automatically stored in an online Google Picasa Web Album. 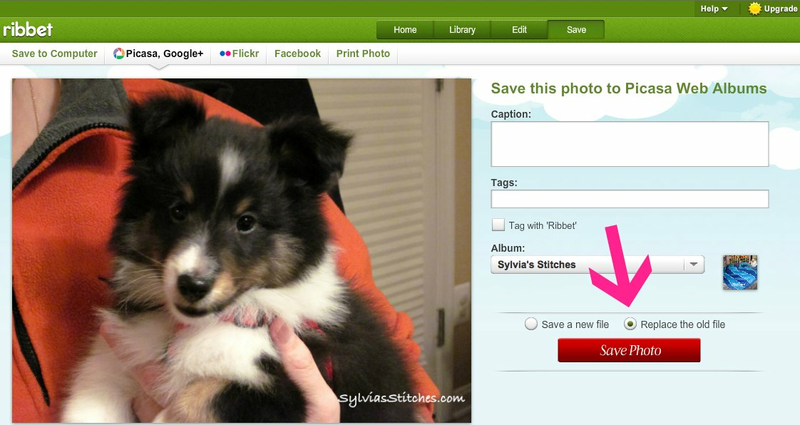 You can view your online photos and albums by visiting http://picasaweb.google.com. The album name is the same as your blog name. 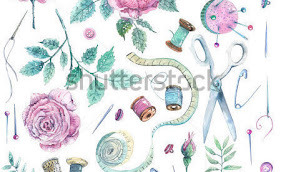 You can do some photo editing online using Picasa Web, but you cannot add text to a photo for a watermark. The website that I now use to edit my Blogger photos is Ribbet. 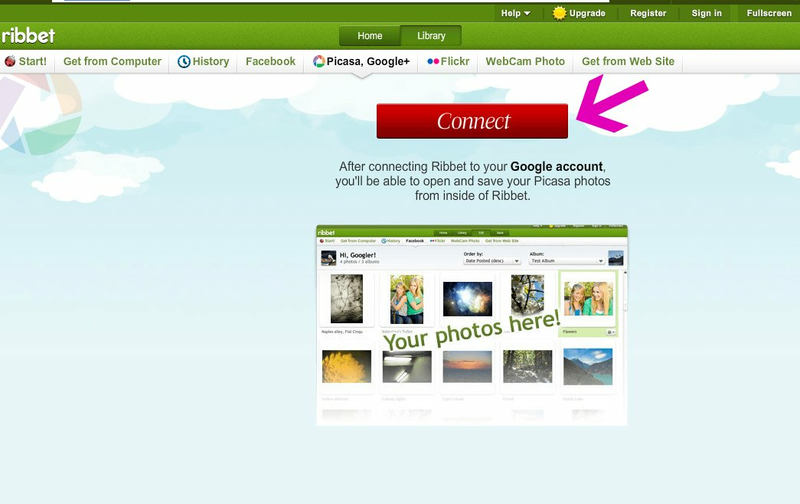 You can create an account on Ribbet for free, but do not need to create an account to edit your Picasa albums. The advantage of creating an account is that Ribbet then remembers your history and connections. 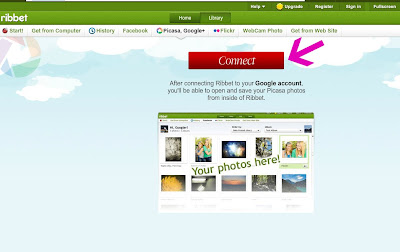 The first time you do this, you will see a message to connect Ribbet to your Picasa photos. You want to do this, so select Connect. You will see a dialog box to ask permission to connect. Go ahead and grant permission. 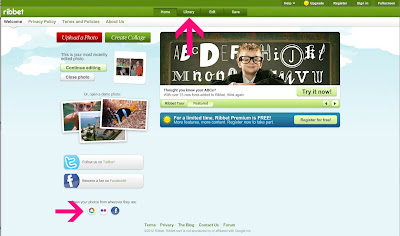 Once you have connected, you may select your blogger album in the drop-down list on the right. 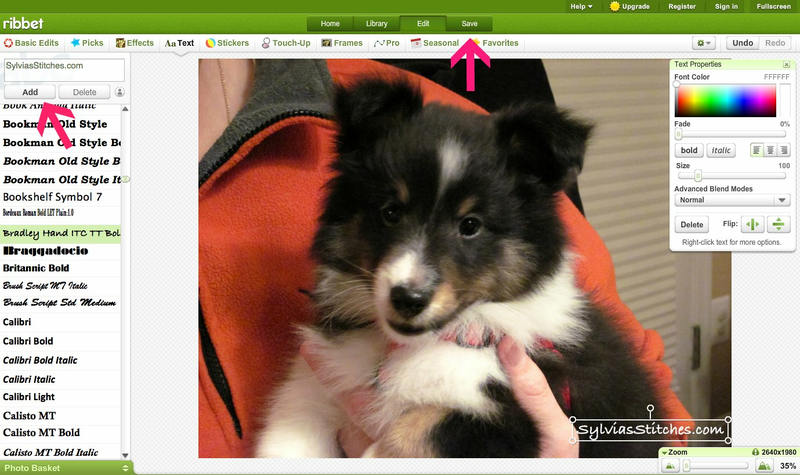 Now you have access to all your photos on your blog! 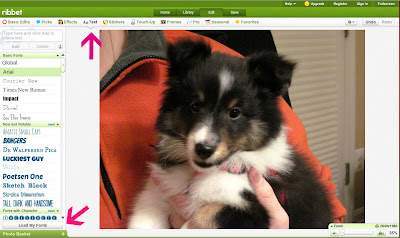 Simply double-click an image thumbnail to edit the photo. Here is an example using a photo of our puppy that I double-clicked to edit. Select the "Aa Text" option on the top Ribbet menu bar. You will see a list of fonts to choose. Notice that the ones shown in blue are "premium" fonts and cost money to use. I stick with the free fonts, shown in black. There is also a button on the bottom to "Load My Fonts". I click this button to see my own fonts. Click on your selected font, type in your text, and select "Add". Use your mouse to move the text to where you want it to be. You can also use the Text Properties box to make adjustments to the text. Select the "Save" tab at the top menu when you are ready. I uncheck the Tag with 'Ribbet' option (just because I don't know what that option does). Make sure you choose the option to "Replace the old file". Then click Save Photo. DONE! 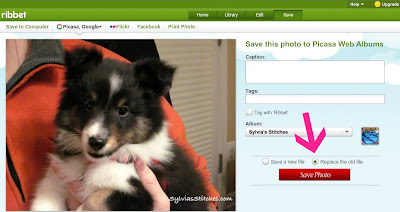 Your blog photo is saved and now will show with a watermark. You can close the photo, or click the Library tab at the top to move on to another photo. 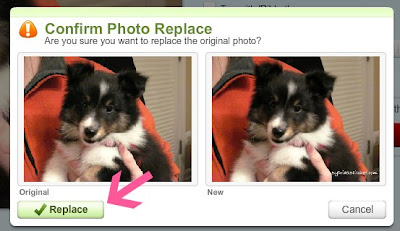 You can check your original blog post that has the edited photo to verify the change. My puppy photo post is here. I'm working my way through my photos now. I get a rhythm going, and have my text string copied to my clipboard so I can just paste it in. Ribbet remembers the last edits, so the next image I select to edit automatically pops up with the "Aa Text" and font selected. I just paste my text, move it into place and save. You'll notice my pics are starting to show with their watermarks. Fantastic! I can't thank you enough! like you, I am now going through my photos on my Blog and putting a watermark. So very generous of you to help the rest of us learn these things, THANK YOU! Thanks for this.. I only recently srated watermarking my images so most of the old blog posts are without.. Great tute, thanks! Thank you for the tutorial, I"m pining now so I can find it again later. Thank you so much for this info. I have wondered how to do this for a while. 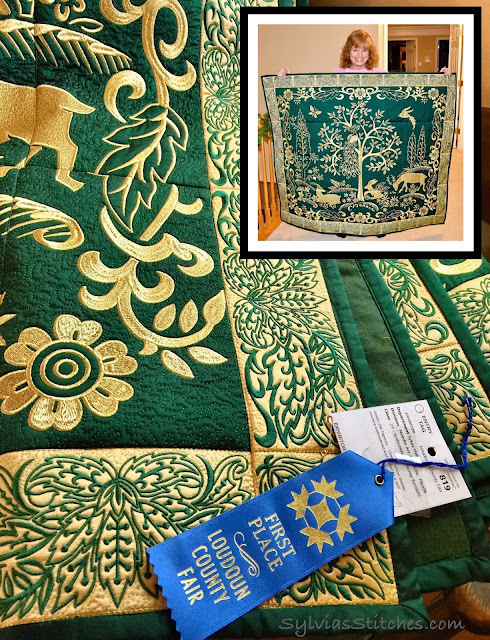 Oh my gosh - I am so glad to have found this! I have been wondering if I should be watermarking the photos on my blog. Cant wait to try it! Thanks so much! I have been searching for a solution to add copyright to my photos for the past two days and finally your post helped me! Thank you so much for this post. 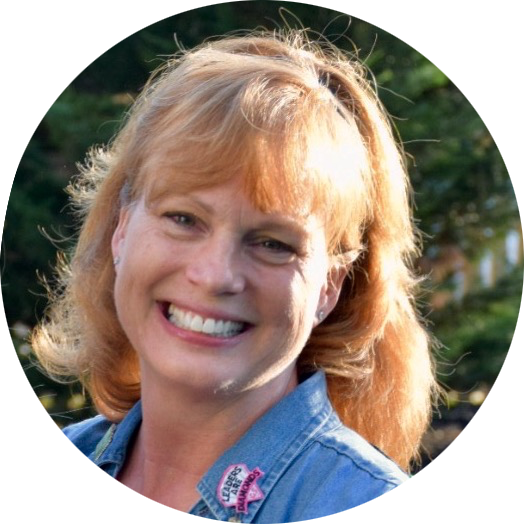 I have been searching for long time to watermark my blogger pics. Thank you so much, I was looking for some solution for the pictures I post from my mobile phone, where I can't add a watermark. Thanks for this post! I was looking for the easiest solution to watermarking and Ribbit works great! Odd, but I notice that photos on blog pages get the watermark updated immediately, but my post photos are not. I am wondering if there might be a delay for some reason for posts? Hoping so, otherwise I just wasted a whole lot of time! LOL Did you notice this at all? Thanks for this informative post!